In the previous post I discussed ANOVA for unrelated samples, which is an equivalent of a t-test for unrelated samples. 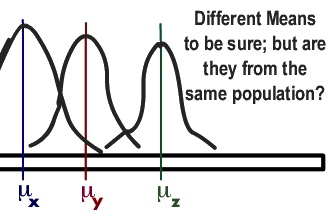 Similarly, within-subjects ANOVA is an equivalent of a t-test for related samples. However, as I stated before, both ANOVAs can be used for comparing more than just two samples. In this post, I will introduce you to t-scores and explain how they are similar to z-scores (remember those? They tell us how likely it is for a particular score to occur). I will also talk about t-distribution and its assumptions and explain the role which t-scores play in Hypothesis Testing; actual calculations and t-tests, however, will be discussed in the next posts. I mentioned Inferential Statistics in earlier posts, but let's recap briefly: it is a set of rules which allow us to imply that results obtained from a sample are true for the population. Now, imagine that we got a correlation of 0.4 after testing the sample of 30 people. How do we know that such correlation occurs in the population as well? And, how do we know if the size of our sample was sufficiently big to be representative? In this post, I will explain what is meant by significance testing. 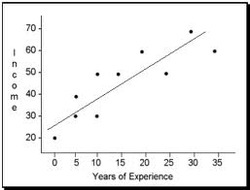 In practice, it does not involve any calculation; in fact, there is a ready-made table of significance which simply tells you whether your result is significant enough or not depending on your sample size and correlation coefficient. However, I think it is important to understand the logic behind this table - and this is exactly what I will attempt to explain in this post. I will give the table in the end as well, so if you are not really interested in theoretical considerations at the moment you can safely go straight there.